Now we'll talk about Test Day. So the first thing we have to talk about is when to schedule the GMAT. So, keep in mind, if you're scheduling the GMAT only one month ahead, leaving yourself only one month to study, that's pretty hard to do, to get a really good GMAT score studying only one month. If you're a super genius, that's fine. But, if you really are ambitious for a GMAT score, it's probably good to give yourself a few months at least. Three months is a good, solid time to study for GMAT, six would be even better if you can sustain studying over six months. But when it is time to make that appointment, you can go to mba.com and register for the GMAT, pay for it online. And you can basically take it just about any day of the year. There are some tests that you can only take on particular schedule days. The GMAT, you can take virtually any day, except national holidays, that sort of thing. When your GMAT is approaching, here are some suggestions. Not for one night, but for the entire week of leading up to the date that you take the GMAT, get at least eight hours of sleep every night. You don't want to, you certainly wanna have a good night sleep the night before, but you really wanna be incredibly well-rested that entire week. Because the effect of sleep deprivation is cumulative, and so you really need a full week of good sleep, so you're really at your best. Also important, eat a good, solid dinner the night before, and eat a big breakfast the day of the test. Think of this, essentially, you're going to be running kind of an intellectual marathon. You're going to need calories for this, you're going to need energy. So it's going to be important to eat. 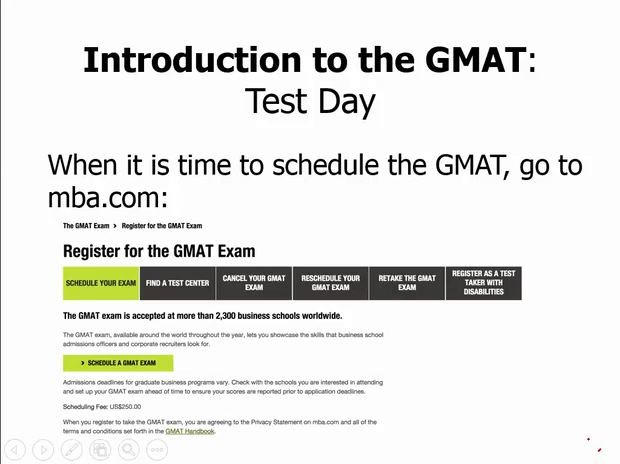 Another important thing to do, sometime in the week before you take the GMAT, watch the interactive tutorial video. So this is online, and this explains all the nuts and bolts of how to navigate the test, how to use the computer and move through all the questions. It's very important to understand all this when you're at home, you're perfectly calm and you're not in the stress of immediately before you take the test. By the time you walk into the test, you want to be able to dispense with this tutorial, just zip right through it, and get to work. There are also a few issues on which you should be clear long before you walk into your test. One concerns the section order. You are now allowed to choose section order on the GMAT. You don't get any possible choice, there are three possible orders that you can choose. Notice, order #1 is the very traditional order, AWA, and integrated reasoning first, then a break, then Quant, then a break, and then Verbal last. Order two begins with Verbal. Order three begins with Quant. Now, you may ask, what order should I choose? Well, this very much depends on you. There are some people, myself included, I prefer to do things that are a little bit harder first, get them out of the way. Quant happens to be something very easy for me, so I probably would do verbal first. Get that out of the way, so that I can enjoy quant later. And so, I would probably pick verbal number two. So some people like to do the hard thing first, get it out of the way, and then they can do easier things later. Other people find that if the hard thing come first, it really frustrates them, or it makes it harder to perform their best on later sections. And they'd rather do something in their strength first and then struggle later. So, I would say, as you're practicing, practice both ways. Experiment with a few different orders. These are the three possible orders. Take at least 1 GMAT in each of the 3 orders, and see how you feel. And it probably will just be very clear to you, I feel much more comfortable with such and such an order, then that's the one you should pick. But all these decisions about order should be completely worked out well ahead of time. So that by the time that you walk into the GMAT, you know exactly which order you're gonna pick. You just pick it and move on, so there's no wasted time there. Another issue should be discussed and worked out long before the day is the threshold for cancelling your score. And this is important for a first GMAT, and it's even more important if you're taking a re-test. Right at the end of the GMAT is the absolute worst time to make any important decision. So you should work all this out beforehand, and ideally, you'll talk about this with some mentors or some tutors. For example, if you're a Magoosh student, you can certainly talk about it with people at student help. Here's what I've done so far. Here's what I've done on practice tests. What would be reasonable? Now, keep in mind that people often perform higher on practice tests, and then, their score may drop a little bit. Sometimes it even drops a lot on the real test. Just because of the heightened stress of the real test. So you shouldn't necessarily hold up your highest practice test value as the cutoff. But all of these are things that you should work out beforehand. You should not be making this decision fresh, starting out at the very end of the GMAT. It should be all worked out already, what you're gonna do. When you go to take your GMAT, bring proper ID. Now, this is gonna be photo ID, it might be a driver's license, a passport, something of that sort. You wanna bring a list of schools to which you want your scores sent. You wanna bring any paperwork about your GMAT appointment. For example, if Pearson mails you something, please bring that along. And it's also important to bring water and healthy snacks. What not to bring, basically anything you don't have to have with you. So don't bring a lot of valuables. Don't bring a big bag or backpack. Don't bring expensive electronics that you don't need. Probably, you'll have your phone with you, but other than that, don't bring other expensive electronics. Just leave all that at home, where it's safe. And you won't have to worry about it at the test site. You will take your test at Pearson VUE testing centers. And when you sign up for the GMAT, they'll give you the appointment, they'll give you the actual address. After you sign in, they will scan your palm. They're actually scanning the unique pattern of arteries and veins in your palm. And then you will have to lock all your worldly possessions in a small locker. So the water, the snacks, your jacket, all of that, anything that's in your pocket, all of that goes into the locker. You can't have your phone with you, all of that goes into the locker. Then, you will be escorted into and out of the test room each time. So you'll be escorted in to begin the GMAT, any break, you'll be escorted out and on each way you scan your palms. Scan your palm on the way out, scan your palm on the way in. Cause they wanna make absolutely sure that it is you and only you taking the test. Once you are seated at the monitor, you will see the tutorial, which theoretically, you've watched already. Then you will see the section order screen, theoretically, you'll already know which order is best for you, and you'll pick it then. And after that, you'll take the GMAT in the order you've chosen. In the course of that, you will get two eight-minute breaks. And we will say, even if you're feeling like you don't need a break, make yourself get up, leave the room, stretch, go out of the room. Maybe drink a little water, walk around a little bit. The purpose of this is to get blood flowing, to get lymph flowing, to get more oxygen into your body. Because, believe it or not, all of that will help you think more clearly. After the test, you'll get the cancel your score screen. Once again, you should already have a clear plan in place, anticipating precisely what you will do at this point. So, you will know your GMAT score, and then it will say, do you want to cancel it. And theoretically, you will already have worked out a very clear guideline about what scores you're gonna cancel and not cancel. And then, finally, when you walk out for the last time, you immediately will get a printout with your GMAT score, and will have all your sub-scores except the analytical writing assessment. Obviously, they can't grade the essay immediately. That takes a little more time. When they mail your GMAT score to you or they send it to you in an email a few weeks later, then you'll get all the scores.